We have a demanding program that requires a lot of hard work and effort. This effort includes not only attending classes and studying individually, but also supporting each other as part of a team-learning process. The program is designed to build upon the practical experience of the participants, creating an environment that allows sharing such experiences. These design characteristics of the curriculum and the program schedule are based on the values we espouse academic excellence, strong work-ethics, teamwork, and practical relevance. While this website provides an excellent overview of Sabancı Executive MBA, we encourage you to visit our campus, attend the information sessions and meet our students, staff and faculty members in order to understand the Sabancı Executive MBA experience. I am sure, upon seeing our excitement about our program, you will want to be a part of this rewarding program and make the right investment for your career. The design and the implementation of the Executive MBA take the part-time nature of the Program as an asset and consider participants’ engagement with the Executive MBA and their daily work responsibilities as complementary learning opportunities. Fundamentally, the Program aims to create an environment where formal input through readings and lectures are integrated with platforms in which participants can learn from their own practices and those of other fellow participants. Hence, there is a heavy emphasis on teamwork and students are expected to be active in class discussions and exercises. Most courses use case-studies to bring real-life issues into the classroom, require students to apply their knowledge in novel situations, facilitate learning through team-work, and improve communication skills through presenting and supporting their analyses. Case-studies are selected from leading case publishers of the world, such as Harvard, Ivey, and IMD, as well as some cases written by our own professors. The building of the Sabancı School of Management is equipped with state-of-the-art facilities to serve degree programs as well as executive development activities. These include lecture halls, teamwork cubicles, and residential facilities. All lecture halls are equipped with the latest audio-visual facilities and Internet connection. The Executive MBA participants also have access to a state-of-the-art Information Center, with its collections of books, multimedia, and periodicals as well as extensive database resources. One of Sabancı University’s underlying tenets is to be “practice-oriented” and nowhere is this principle taken more seriously than in the Sabancı School of Management. We have a number of programs in the Executive MBA program to allow participants to learn from successful executives. The Executive Insights series provides a forum where successful executives share their life and work experiences together with our students and alumni. These events are held mid-week, downtown and thus also provide a great venue for our alumni and current students to network. Executive-to-Executives conference series is held several times every term and they feature in-depth presentations by visiting executives. Our goal is to invite not just successful executives to these sessions, but those whom we call reflective practitioners, managers who have taken time to reflect on their successes and failures, and have derived lessons from their experiences. Improving the Ability to Diagnose Global & Local Problems and Opportunities: Identify and diagnose business problems and opportunities accurately and effectively across a wide range of business domains (accounting, financial management, operations, marketing, strategy, and organizational design), in global and local contexts. Incorporate Cultural Context and Complexities in Their Managerial practice. Improving Performance Evaluation & Management Skills: Assess the performance of an organization in a wide range of business domains, using a range of performance criteria. Growing Awareness of Social & Ethical Responsibilities: Reflect on social and ethical responsibilities linked to the application of their knowledge, judgments, and decision making in various business contexts and in relation to business actions, policies, and proposals. Enhancing Leadership Skills: Take leadership in collaborating with others in situations characterized by differing interests, diverse perspectives, and skills, in order to create working environments characterized by a sense of mission, shared values, and high levels of commitment and motivation. Enhancing Communication Skills: Demonstrate proficiency in oral and written business communications in English. Enhancing Interpersonal Influence & Persuasion Abilities: Listen, present, discuss, negotiate, and interview effectively in a managerial role; communicate ideas, analyses and recommended actions persuasively - using appropriate technology where necessary. Improving Analytical Thinking Decision Making Skills: Be analytical decision makers and pursue open-minded inquiry; appreciate the importance of research as an input into managerial practice; be discerning consumers of practitioner-oriented research; and be able to access, analyze, and interpret information by using current technologies. Enhancing Strategical Thinking & Planning Skills: Identity, select, and justify strategies and courses of action at the divisional, business, and corporate levels of analysis and to develop effective plans for the implementation of selected strategies across a wide range of business domains and levels. 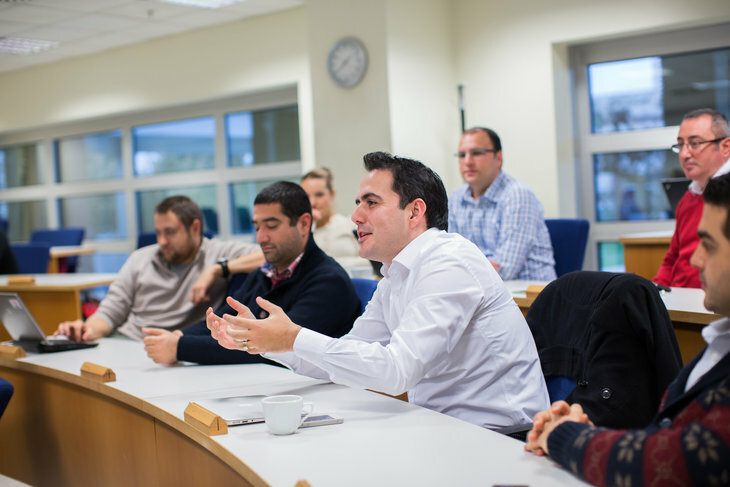 Sabancı Executive MBA is a 12 months intensive program organized in two six-month long semesters. The first-semester concentrate on the development of the academic foundation. Moderately theoretical courses that are designed to develop analytical and business skills and knowledge are provided. In the second term, the students take Organizational Behavior & Leadership, Ethics in Business and Business Simulation courses as well as electives to gain knowledge and skills necessary to lead and run an entire organization. During the second term, the students will visit Columbia Business School & will take courses in Leadership, Innovation & Entrepreneurship. For the Executive MBA degree, participants take a total of 17 courses, completing 30 credits. As in all Master’s degree programs, in order to graduate a student needs to have a cumulative grade point average of 3.0. Applicants to the Executive MBA Program should have a four-year undergraduate degree and full-time work experience of at least 6+ years after graduation, preferably managerial. Starting from the 2013-2014 academic year, ALES or equivalent test scores are not required for the applications to Executive MBA program. English Proficiency Exam Result: Accepted English proficiency exams and the minimum required scores are TOEFL IBT 83; KPDS 69; ÜDS 69; YDS, e-YDS 69. Photocopy of exam results is acceptable for application, but original documents should be submitted for admission. The validity period for these scores are as follows: KPDS, ÜDS and YDS 5 years, TOEFL 2 years.